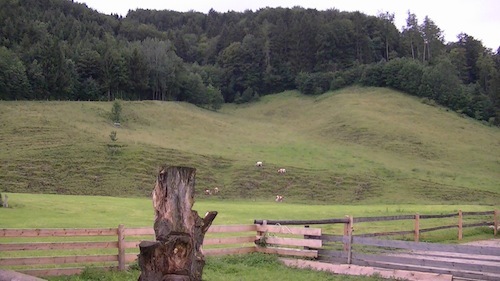 Last month, I went on a family vacation to a farm called Beim Aubauern. 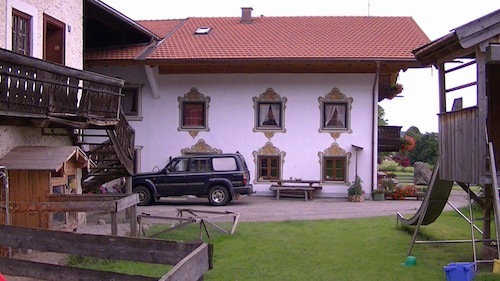 The farm is located in Bergen in the state of Bavaria, Germany. I love farm animals, so I was excited when I found out we were going on a farm vacation. The farm was an exciting place. My brother and I were thrilled when our car finally pulled in the driveway after six hours of driving. Next to the driveway was a big pen, in which there were hens, a rooster, baby goats only a few weeks old and three parent goats. 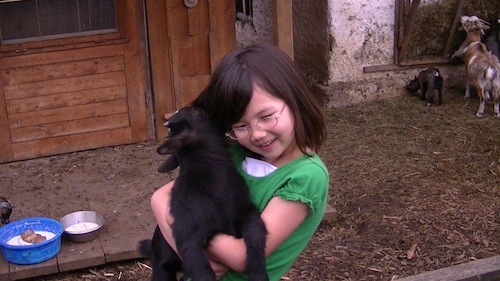 I loved playing with the goats every day. The baby goats were the cutest things I had ever seen. They encircled us and leaped on us with their front legs. They nibbled on our clothes so we had to always push them off before getting covered with the goat saliva. 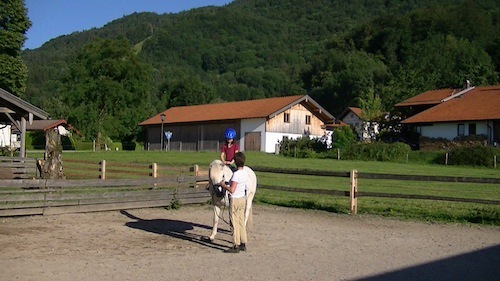 The best part of the farm for me was riding the pony and horses. I wish I had more time to ride the horses, but then again, there is always another time! The farm was also very educational. I learned about the different dairy farm operations by helping at the farm. The farmer milked the cows twice a day, and I was allowed to help milk the cows during the afternoons. The farmer normally uses machines to pump the milk, but she let us milk the cows by hand just for the experience. She then put fresh milk in a bottle and gave it to us for a drink. The milk tasted creamier and sweeter than any grocery milk. Here is an amazing fact: A cow gives 15 liter of milk every morning and evening!! I had an adventure outside the farm, too, which rescued my parents from boredom they felt at the farm. 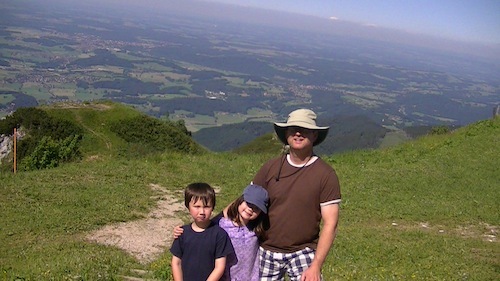 We rode a cable car to Hohefelln, a high point at the Alps. Every time we came by a big tower that guided the cables, the cable car swayed slightly. My mom gasped with terror, but I was not scared at all. While the cable car went up, dangling in the air, I stood safely inside looking out of the window, with my mouth open with amazement. I could see the Chimsee Lake, the farm and the whole area beneath us. I saw friendly hikers waving at us, parashooters, and cows grazing on the grassy hills below. One morning we drove to Prien, a harbor town at the Chimsee Lake. From Prien, we sailed on a ship to Herrenchimsee. Herrenchimsee is a fascinating place because it is an island in a lake. We ate at a restaurant near King Ludwig II’s castle. King Ludwig II was the King of Bavaria, named the mad king because he was very wacky, but he sure had nice castles. 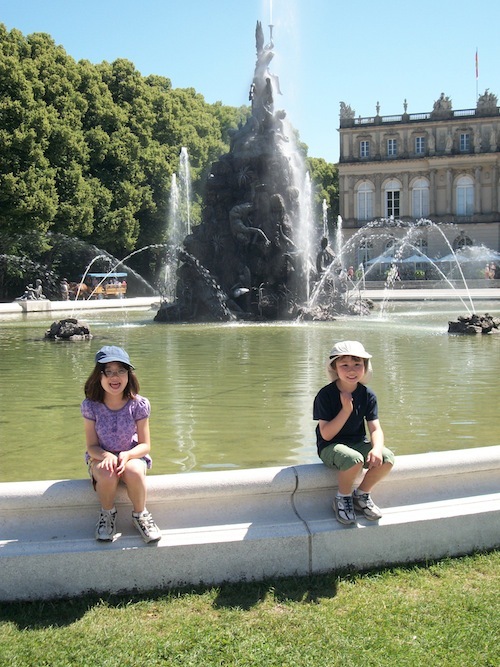 The castle in Herrenchimsee is supposed to be very fancy because it was modeled after the Palace of Versailles in Paris. We did not have time to go in the castle so we played in the courtyard. 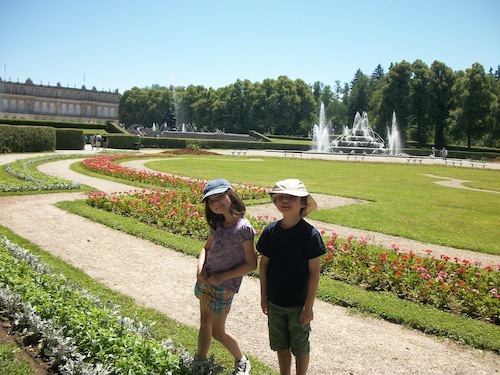 I also enjoyed our little walks around the village, looking at the Bavarian style homes, seeing the farm animals on the field, and also playing in the pretty streams. My brother and I built bridges and dams with little rocks and had a lot of splashy fun. Sadly, the vacation had to end, but I took many pictures to help me remember the good times in Bavaria. I will go there again soon, I hope.